If you have read my other blogposts you might have found me complaining of Jane Austen in the past. 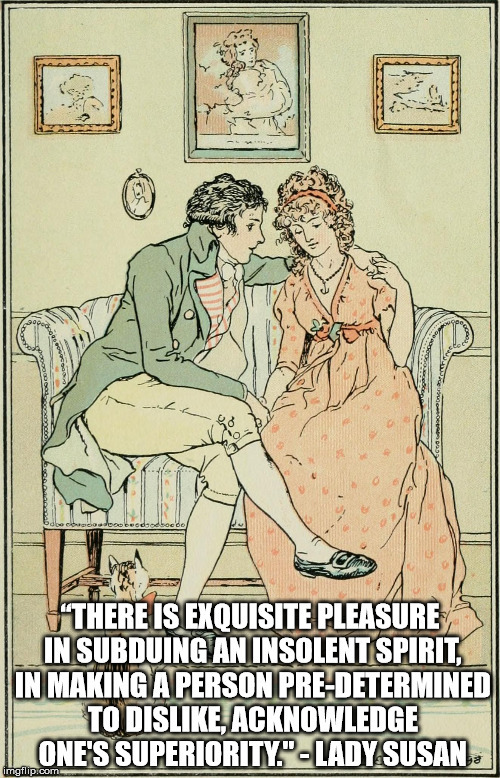 I do like Jane Austen, but for me she has two things that make it difficult for me to LOVE her. It’s brilliantly written, but honestly I was just like her. Yes, you didn’t know any actual good of her before talking about her “pretty eyes”, except of course that she wasn’t trying to kiss up to you. If you don’t agree please let me know. What am I not getting? She has such a wonderful way with words (hey alliteration) and it kind of bothers me that I don’t like her characters more (at least for the most part). 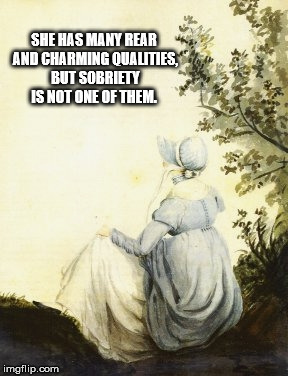 Lady Susan d oes suffer from both of these elements, but especially the first one actually works in favour of the story rather than against it. Lady Susan is an epistorial novella, it’s written through letters sent by the characters, so not knowing everything is part of the package. Which is why it’s interesting. I started to question the motives and the way the world was described for me. Lady Susan has two personalities, one to her friend and one to everyone else, but we can only guess her own feelings or mind. The other main writer, her sister-in-law Mrs Vernon is set against her from the beginning and therefore quite biased. This is not to say that Lady Susan is a kind woman or anything like that, but when her daughter Fredrica is introduced and we get two very different descriptions of her which are we to believe. Her mother, whom is quite a capable woman and annoyed about Fredrica not being that capable, or Mrs Vernon who might see Fredrica as an enemy-of-my-enemy-and-therefore-my-friend. We don’t know, we aren’t supposed to know. It has been pointed out, and it really is a fault of the story, that there is no other well-written characters besides Lady Susan. However you may end up feeling about her, she is at least an interesting one and there is no other person really worth talking about. But then again Lady Susan is woman enough to handle her herself. youthful writing, which I am getting and reading because I laughed so much from this tiny, tiny book (55 pages). If you have read my Pinocchio review, I talk about liking the humour in Pinocchio because it’s very meta. You laugh of the absurdity which the characters in the story doesn’t necessary realise. This book wasn’t dark though, like Pinocchio, so for the people who were discouraged from reading Pinocchio because of that can read this one in stead. The language is clearly written by someone very young and you won’t find the sophisticated language of her later work. They are just incredibly funny short stories written to entertain in a world before the internet or television. The singularity of his appearance, the beams which darted from his eyes, the brightness of his Wit, and the whole tout ensemble of his person had subdued the hearts of so many of the young ladies, that of the six present at the Masquerade but five had returned uncaptivated. I daily became more amiable, and might perhaps by this time have nearly attained perfection, had not my worthy Preceptoress been torn from my arms, e’er I had attained my seventeenth year. I never shall forget her last words. “My dear Kitty” she said “Good night t’ye.” I never saw her afterwards,’ continues Lady Williams wiping her eyes, ‘She eloped with the Butler the same night. She then proceeded to a Pastry-cooks where she devoured six ices, refused to pay for them, knocked down the Pastry Cook and walked away. The Beautiful Cassandra is a part of the Little Black Classics printed by Penguin (not sponsored).